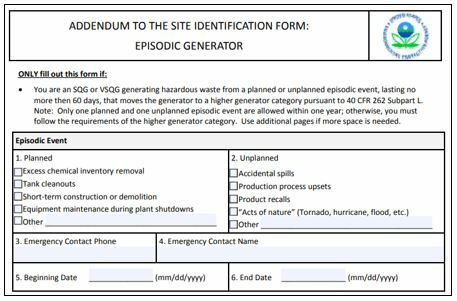 Episodic generation is the term used when a site is a small or very small quantity generator, but something occurs causing the site to generate hazardous waste over their generator category’s quantity limit. For example, if you generate 800 kg of hazardous waste in April, your site is a Small Quantity Generator (SQG) for April and you must manage the hazardous waste generated during this month in accordance with the SQG rules at 40 CFR 262.16. If in the next month, your site generates 1,200 kg of hazardous waste, your site is now a Large Quantity Generator (LQG) for May, and the waste generated in May is subject to the rules applicable to LQGs at 40 CFR 262.17. Either a planned or unplanned event might be the basis for an increase in your generator status. EPA defines planned and unplanned episodic events at 40 CFR 262, Subpart L. A planned event could include waste generated from regular maintenance, tank clean-outs, short-term projects, and removal of surplus chemicals. In other words, you planned an activity that you know will produce more hazardous waste. An unplanned event includes anything that you did not reasonably expect to happen, for example, production process upsets, product recalls, accidental spills, and acts of nature. The notification for a planned event must be made at least 30 calendar days prior to the start of the event using EPA Form 8700-12. For unplanned events, you must notify the EPA or the authorized state environmental agency via phone, fax or email within 72 hours of the event, and subsequently submit form 8700-12. The notification includes information on the event such as emergency contact name and phone number, beginning and end date of the event, waste descriptions and estimated quantities, and state and/or federal waste codes. Generators are allowed one episodic event per calendar year, but may petition the EPA or state for a second event in the same calendar year, provided the second event is the opposite type. For example, if your site has already had a planned event during the year, you may only petition for a second episodic event if it is an unplanned event, and vice versa. Information regarding the previous episodic event, including the nature of the event, whether it was planned or unplanned, and how the generator complied with the conditions. 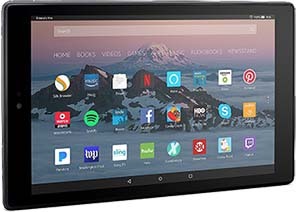 The petition must be sent to the EPA Regional Administrator in writing, either on paper or electronically, and the approval must be maintained on the generator’s site for a minimum of three years from the date the episodic event ended. Some states use a state-specific form in place of EPA’s Form 8700-12, and have their own deadlines for submitting or revising their form. Check with your state to determine if there are state-specific requirements, and refer to the State Contacts list posted on EPA’s website to determine where to send this notification. To learn more about how to determine your hazardous waste generator status, see Environmental Resource Center’s February 8, 2018, Reg of the Day™. To learn more about when to notify EPA of changes in your hazardous waste activities, see the May 31, 2018, Reg of the Day™. And to learn more about managing episodic hazardous waste, see the February 15, 2018, Reg of the Day™.